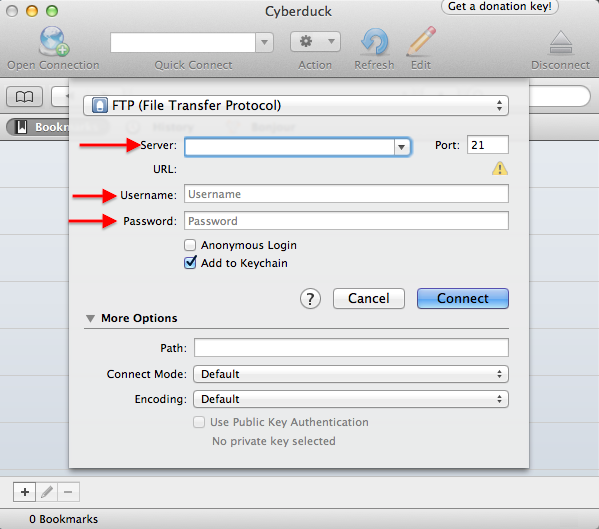 The following is a write up on popular FTP clients built for the Mac and how to set them up with your TCH account. FTP, or File Transfer Protocol, allows you to view, download and upload files to your server / website. It also allows you to edit your server’s file structure and system remotely. In order to utilize this protocol you’ll need a FTP Client. We tested a wide range of FTP Clients available and decided to review the select few that we found to be the best. Platforms: Mac OSX and Windows. 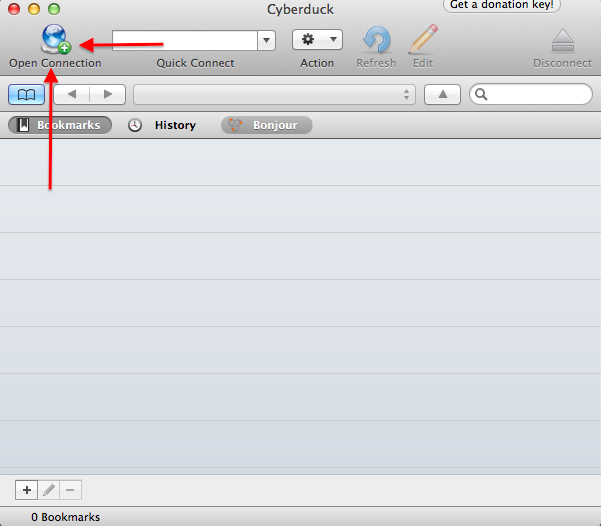 Cyberduck has long been the preferred by most Apple users. It is built for fast and easy use with a fast connection making bookmarks list and a clean layout. Though this application was made to be a File Transfer Protocol Client, some features you can enjoy with this app are, WebDAV (Web-based Distributed Authoring and Versioning), Amazon S3, Windows Azure, Rackspace Cloud Files and even Google Drive. While this application is free, you can remove the pop-up ads by either buying it through the Mac App Store or donating through their site. 2. When prompted, enter your information (Host, Username, and Password) into the designated boxes. For Host you should enter ftp.yourdomain.com (replacing yourdomain.com with whatever your real domain name is) and then enter your created Username and Password. When completed, Cyberduck should look like this. 3. 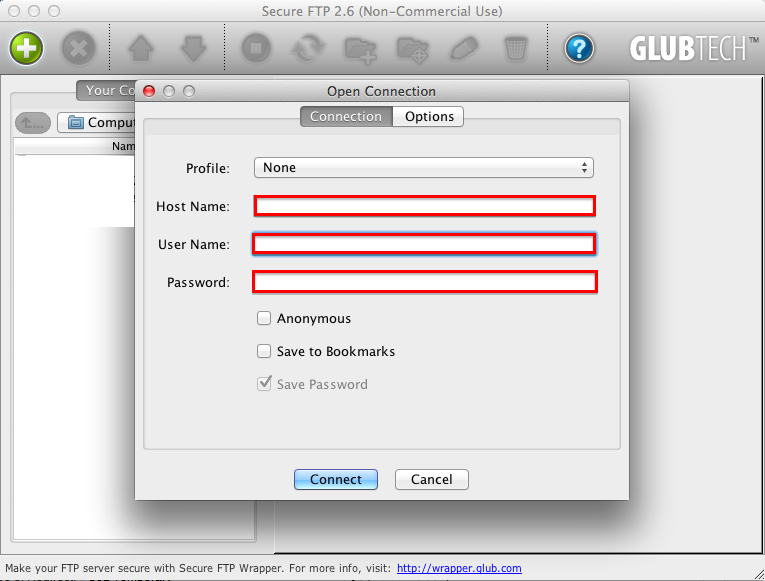 If asked to change to FTP-SSL over FTP, click either change or continue depending on whether your server supports FTP-SSL. Most servers, especially web-severs, do. I recommend choosing “change” because it is a more secure connection protocol. 4. There you go! You should now be able to view your server’s files. Platforms: Mac OSX, Windows, and Linux. 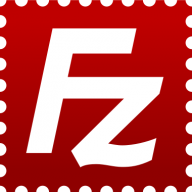 FileZilla is a reliable but seemingly barebones competitor. Unlike Cyberduck, you can’t enjoy the same compatibility features of WebDAV (Web-based Distributed Authoring and Versioning), Amazon S3, Windows Azure, Rackspace Cloud Files and Google Drive. 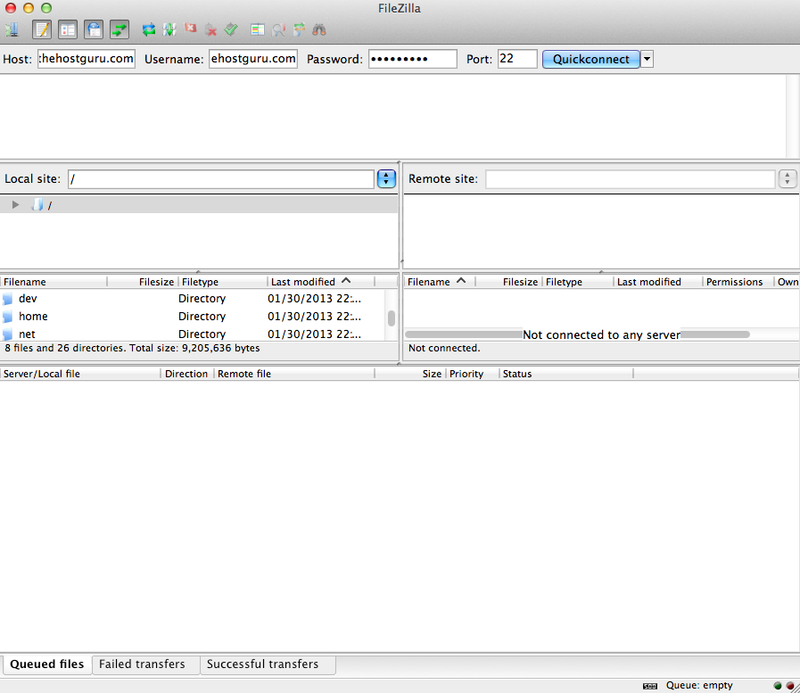 While it always does its job as an FTP Client well, FileZilla seems to lack some tidiness in it’s user interface. However, some may prefer this user interface to others because it has a very “all out there” look, meaning that basically everything (with a few exceptions) you need to see or use to complete your transfer or edit, is right in the main window of FileZilla’s interface. This can be a pro or a con depending on the user, some may describe its interface as busy, while others describe it as space saving and efficient. Another great aspect of FileZilla is that its cross-platform, so there is no need to learn how to use FTP clients across multiple operating systems. At the end of the day FileZilla does a great job of being a FTP client. 1. Open FileZilla and enter your information (Host, Username, and Password) into the designated boxes. For Host enter ftp.yourdomain.com (replacing yourdomain.com with whatever your real domain name is) then enter your Username and Password. 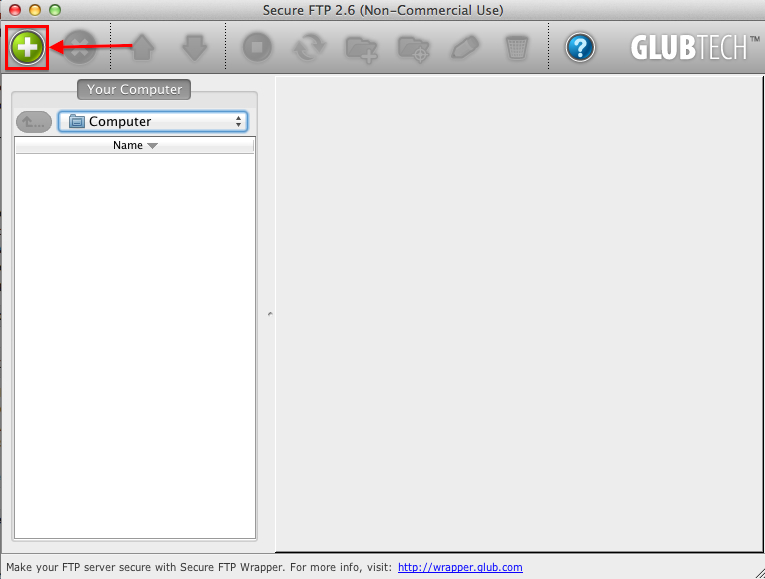 Enter 22 under “Port:” for FTP-SSL (recommended) and 21 for standard FTP. When completed, FileZilla should look like this. should now be able to view and edit your server’s file system. 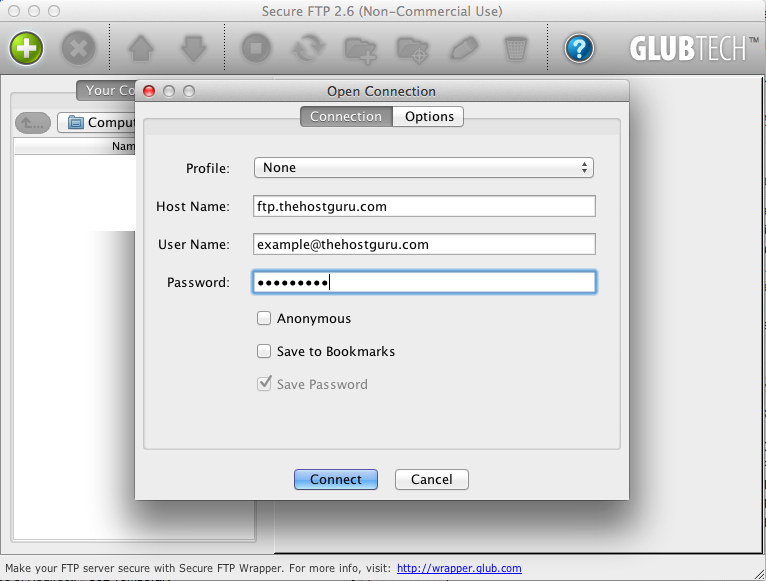 “Secure FTP is a Java-based FTPS client application that allows for a 256-bit AES encrypted secure connection to be made to a server that supports FTP over SSL (or FTPS).” As boasted on Glub Tech’s website, Secure FTP takes security as its main priority while not having sacrificed any features. 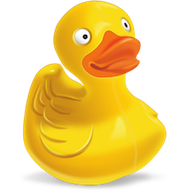 However, just like FileZilla, it does not offer the same compatibility features as Cyberduck. 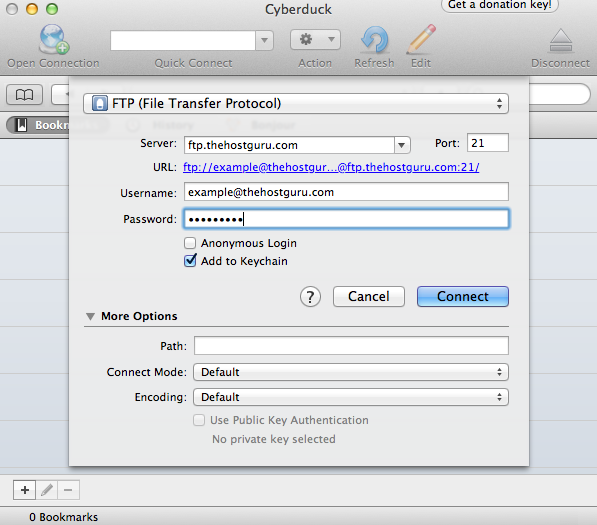 Furthermore, Secure FTP has a very organized and clean interface that is very comparable to Cyberduck’s interface. Just like FileZilla we found Secure FTP to be very reliable and fast. 1. Click the Green and White + button. When completed, Secure FTP should look like this. 3. Now, all you have to do is click connect and there you go! You should now be able to view and edit your server’s file system. The Bottom Line: All three of these Applications are very good at what they do. Therefore, the “winner” may not be clear cut to you, so I recommend picking one based on your needs and likes. However, my recommendation is FileZilla for reliability and simplicity of its interface, because whenever I use FileZilla I see what I need to use right in front of me, and that cuts down on time significantly.